A simple XY-scope using JACK for audio input and OpenGL for video output. There are other software oscilloscopes supporting JACK, but I couldn't find one with XY mode. You can use it as a regular oscilloscope by putting a timebase signal in to an X input. 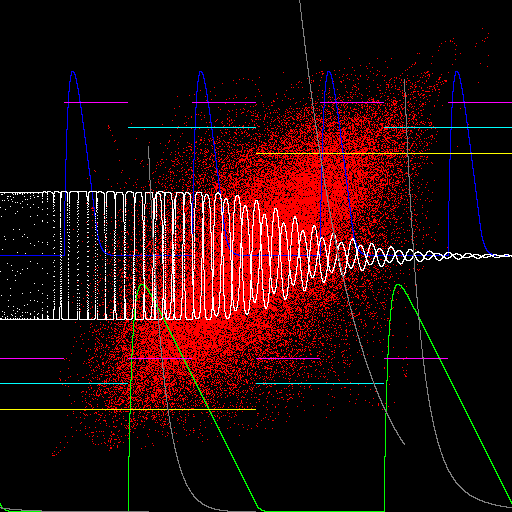 All inputs are assumed to be normalized in the range -1 to +1. The window size, JACK client name, and input channels (8 XY pairs in different programmer colours) are hardcoded for now. Edit the source code and recompile to change them.